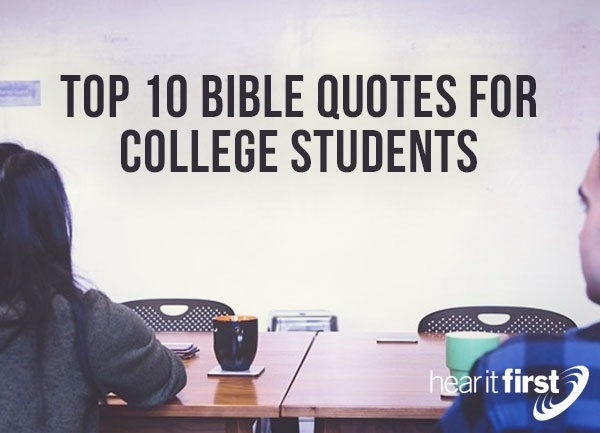 Here are ten great quotes for college students to read. If we get this one right, the rest will be considerably easier. I don’t mean that college will be easy but if you first understand that the very beginning of wisdom is the fear of God, which means a deep, holy, reverential fear or respect of God, then you’ll have a solid foundation with which to stand on because only fools despise wisdom and instruction from God, and it’s to their own hurt that they reject the fear of the Lord. Are you sure that what God began in you, He will complete? The Bible teaches this in many places but God may not complete this until the day of His return, but in the meantime, He’s at work in us and will often use others to help us complete some of the good works that God has planned for us to do but most of all, He will complete in you what He began in you on the day when you trusted in Christ. Who is it that will fall or faint and become weary? I think that includes all of us from time to time but even when we’re exhausted the Lord will renew our strength but only for those who wait in Him. It’s just as dangerous to walk behind the will of God as it is to walk in front of His will for our lives. Feeling weary in your college course work? You’re not alone in this because just as the God Who saved you will, He will also strengthen you when you are at your weakest. When I was in college years ago, I tried to be a model of godliness but as expected, that brought some persecution but it’s even harder for students today to profess their faith in college because of the secular philosophies being taught on most campuses, however if we live godly lives, we have nothing to ashamed of. We cannot be condemned, even by our enemies, if our conduct includes a life of integrity, dignity, and sound (or clean) speech. Did you know that you were predestined from before the foundation of the world to be, not only saved (Eph 1:5), but to do good works for Christ that God has ages ago foreordained for you (and I) to walk in or to do for Him. These were prepared for us to do before there was even an “us!” We are His workmanship, created in Jesus Christ, and this workmanship includes good works for us to do. These good works do not save us but rather, we were saved to do them from before we existed. Just mind boggling, isn’t it? The context if Philippians 4:13 doesn’t mean we can do all things that we think of doing but rather all things that God’s purposed for us to do so he alone receives all the glory for it. The context of the Apostle Paul’s statement is that of doing all things, regardless of depravity or hunger and in times of plenty (Phil 4:12). Paul had to learn how to be content in all his sufferings but this means we can learn it too…it just takes a lot of practice. I love the fact that fewer words don’t reveal our ignorance as easily as many words but in the context of this verse, Solomon is simply saying that when cooler heads prevail, we will restrain ourselves from saying something that we might later regret. Since we have two ears and one mouth, is God telling us we ought to be twice as fast to listen as we are to speak? Why would Paul say, “Look carefully then how you walk?” It’s because there are many who are watching us, just waiting for us to slip and fall so that they can declare all Christians as hypocrites. One person once told me that the church is full of hypocrites and that’s why he didn’t want anything to do with church but I told him, “There’s always room for one more” but then I told Him, every one of us will have to stand before Christ and give an account (Rom 14:12; 2nd Cor 5:10) and you won’t be allowed to drag all of these “hypocrites” before you and make them speak for you before Christ. Nope, you’re going to be there all by yourself so be careful in how you live before others, particularly unbelievers. Attending a secular and very worldly college can lead too many temptations so James suggests “Submit yourselves therefore to God. Resist the devil, and he will flee from you” (James 4:7). If we are already submitting to God we’re likely to experience less temptations and youthful lusts but Paul also mentions pursing righteousness. If we flee from temptation and pursue righteousness, it should be easier to resist the devil and have him flee. Maybe it’s because the devil just can’t stand seeing godly living. When you are in college, you are helping your future considerably, but this future of yours is not for your own personal gain alone. We can’t or at least we shouldn’t do anything just out of selfish ambition. Ambition is okay…it’s the selfish part that gets us (and me) in trouble. Paul suggests that we don’t only look at our own interests but the interests of others because God’s saved us for just this reason. Yes, it’s true, there is no “I” in team but there’s a “me” and it just so easy to make it all about us. If you’re in college or know someone who is, please send them this link so that they can be encouraged by the Word of God. The Word of God has real power to change us and college students, in fact all of us, need to change and become more Christ-like but it doesn’t happen in a vacuum. We need God to strengthen us, shape us, mold us, and sustain us during our college years and beyond but the starting point for all of us is to first grasp this truth: “The fear of the Lord is the beginning of knowledge” (Prov 1:7a). Begin with that and stay with that and you should be just fine.